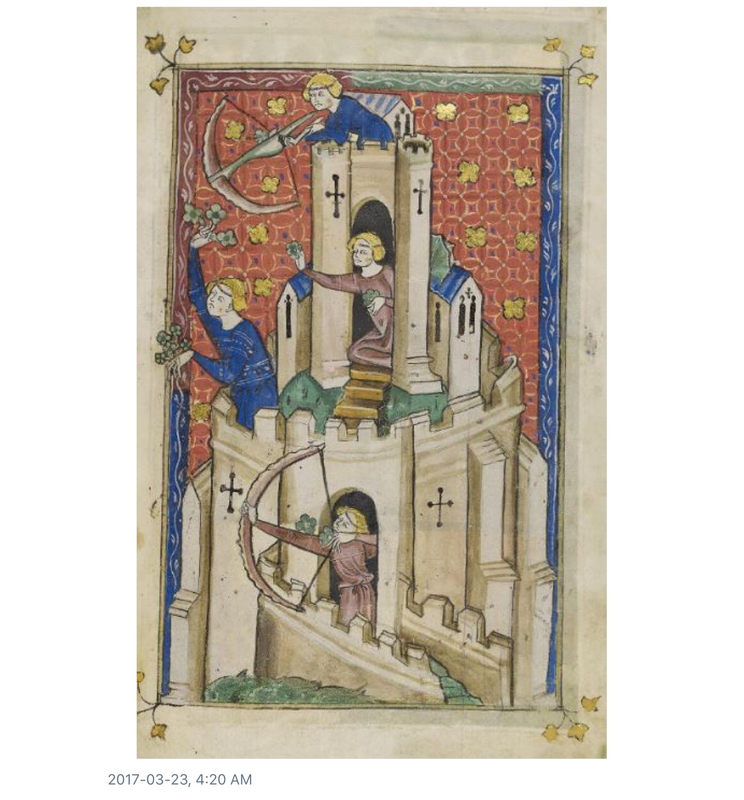 This is the story of an actual real live damsel in distress in a tower. It contains little amusement and is lugubriously and long-windedly serious. My office is on the 7th floor of a lofty concrete Brutalist masterpiece from 1972 that houses some of my university’s Faculty of Arts: Central, Eastern, and Northern European Studies; English; French, Hispanic, and Italian Studies; History. This tower’s principal “ivory” quality is its remarkable resonance. I have gained a new understanding and respect for Roland’s unwillingness to sound his olifant. In all the time I have been here, The Tower has been constantly and consistently noisy: construction work on it or at its foot, the infamous beeping reversing service vehicles that park and do three-point turns next to it, the beeping garbage trucks that for some mysterious reason are here off and on all day long (everywhere else I’ve ever lived and worked, there were strict hours so as to minimise disturbance to both sleep and work; for example, only operating for one or two hours in the morning and one or two in the evening, and always at fixed times). The light, normal, regular noise levels are like being on a building-site. That has changed for the heavier, a new Golden Age of Sturm und Drang. Noise has escalated to dramatic levels, with bonus unpredictability. A vague sense of being besieged by noise is now the very real presence of siege engines, and invading forces in protective clothing and bearing equipment. What follows here below is from last week: raw material arranged in approximately chronological order. There may be something here that’s useful for future letters, petitions, and negotiations. I’m hoping this historia calamitatum won’t turn into an exemplary case-study of the effects of excess noise on wellbeing, or into a rather tedious epistolary novel. I’m not sure which would be worse. Wrote a post on here. Felt somewhat less awful. “Better” might be an overstatement. Headache starts again on campus, before I get to my office. Two responses to the previous day’s Twitter-grumbling. Phew. Characters. Plot. It’s not just a single tragic hero confronting a nightmare alien world, or alone in a solitary hell maddened by noise, or imagining things and yelling into the void. Introducing interaction makes matters more (interesting and) human and hopeful. [Anonymous 2 to me] 4:00 p.m.
[…] The noise experienced on Monday was related to the changing of the windows on the 9th and 10th floors. They essentially need to drill out the bolts from the old windows, hammer out the frames, drop in new frames, and drill those in. The process is loud, causes vibrations, and goes beyond being disruptive to the point of causing personal discomfort. Unfortunately this work must proceed to comply with tight deadlines and it cannot occur in the evenings as they need to work in the daylight. There are safety issues and restrictions on noise for surrounding residences as well. That said, we are working on a plan to ensure what happened on Monday doesn’t happen again. Mainly that such intense work will be scheduled and communicated in advance so occupants can plan meetings, seminars, and work locations accordingly. 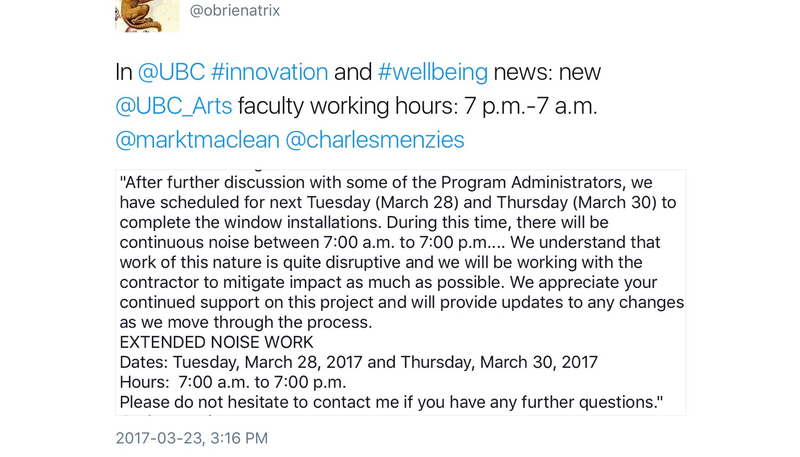 Administrators will be receiving a communication with a noise schedule that they will distribute to their respective departments. This phase of construction will pass and we appreciate your patience as Project Services tries to get this work done as quickly and unobtrusively as possible. [Me to Anonymous 2] 6:26 p.m. Thank you […] I do appreciate your intentions and courtesy, and your having made the time and taken the trouble to email me. 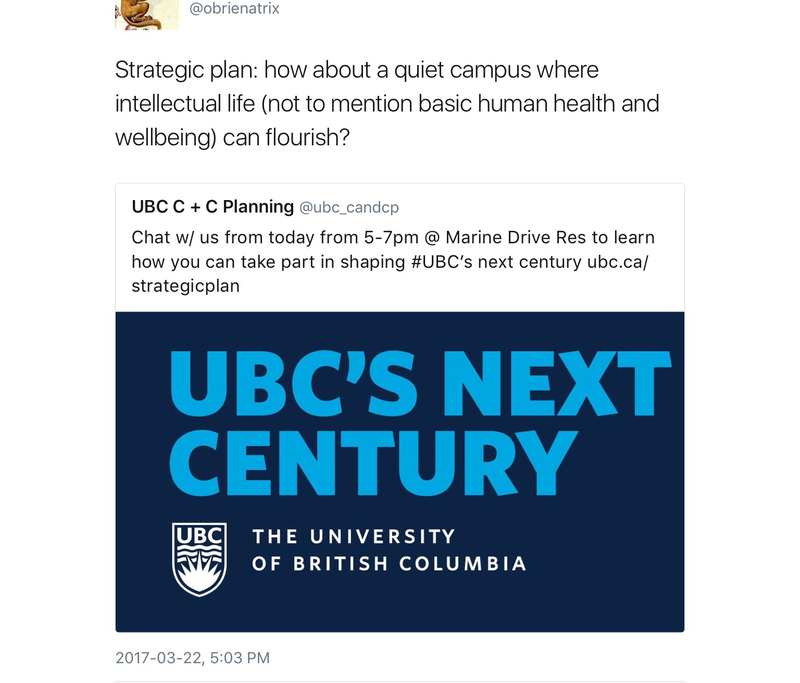 […] This is not the first time that other activities have been deemed to be a higher priority and of greater importance than faculty and student work—the core and indeed defining activity of a university—or their wellbeing: a constant at UBC in my own direct experience for several years now. 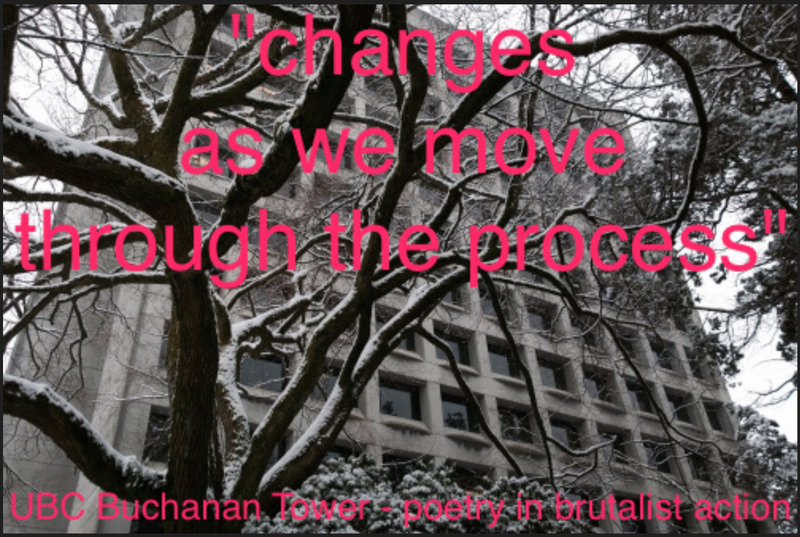 I trust that you can see how, given the circumstances, asking for patience can therefore sound placatory and a little like adding insult to injury: until an improvement in faculty working conditions is actualised in material reality. This is not about booking rooms and planning seminars and meetings. That is only a part of faculty work: our core [and defining] work—[… that is, what defines it as a university as contrasted with any other kind of thing, place, or workplace]—is teaching and research. Faculty should be able to use their offices for that work. Our work is not simply teaching a certain number of classes per week. So, for example, I don’t just work 9 hours a week but actually between 40-odd and 70. All of these regular activities require uninterrupted concentration over longer periods of time and usually add up to around 5-8 hours per day. Concerns: It would be great to be able to use our offices (this goes for both faculty and staff) during regular working hours (say, 8 a.m. to 5 p.m.). If that is impossible, it would be good if there were some times of day when we can be guaranteed appropriate working conditions: that is, put very simply, quiet. 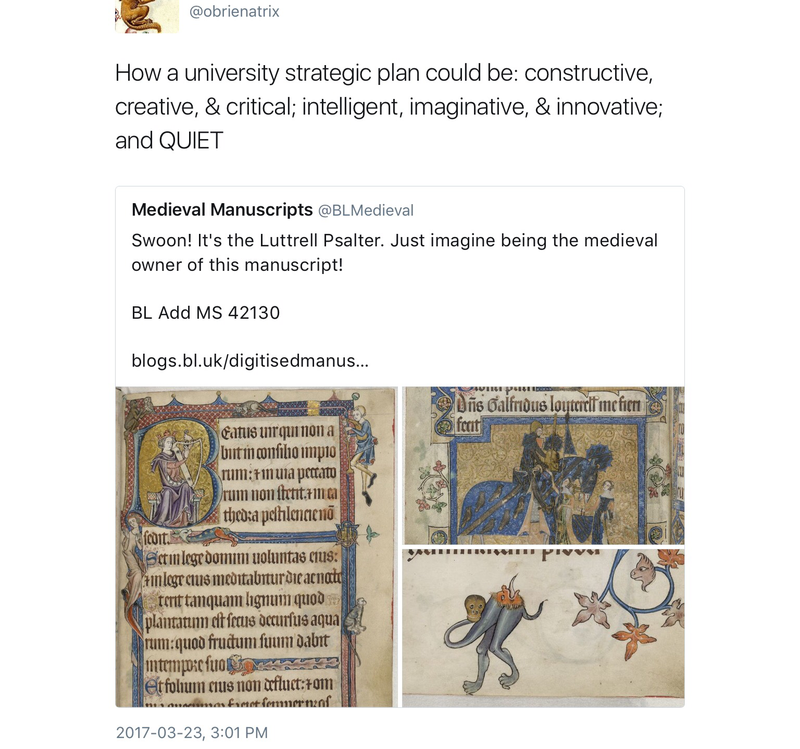 And if would be wonderful, for the future, if the need for quiet could be taken into consideration when planning non-academic work that disrupts academic work. Within reasonable limits, of course. If quiet can only guaranteed at times that mean that faculty and staff can only enjoy appropriate working conditions at times that extend our working days several hours before and after 8-5, there may be contractual complications. An example: currently the only times when I am guaranteed quiet in my office are before 8 a.m. and from around 7 p.m. onwards. If I need 6-7 hours of such quiet working time per day, that extends my working day from, say, 6 a.m. to 11 p.m. Without even taking into consideration eating or domestic life or leisure, this cuts into sleep, which then affects health and wellbeing. It would also be unreasonable to expect students to meet with faculty in their offices late in the day. Furthermore, it would be unwise as a matter of student (and indeed faculty) safety. In the meantime, it might be a constructive idea to provide those affected by noise with the same level of ear-protection that [is] deemed adequate for construction workers on the other side of the noise. I enjoyed a 6-hour headache yesterday […]. Headache returned on campus this morning. I am still recovering. I will manage, probably, but I would ask you to please consider other colleagues who are more fragile. Constant harassment by noise causes breakdowns. That’s why noise is used to break people, in a very different kind of workplace. This is not mere personal discomfort: damage has been done, continues to be done, and is aggravated by unpredictability. The only control I have over noise, and my own wellbeing, is by interrupting my work and taking it elsewhere; which means that I cannot work in my office or with colleagues. Colleagues being in offices next to each other in their department helps us to work collegially, which is important to how scholarship is done and how academia works when it is working at the best and highest level. 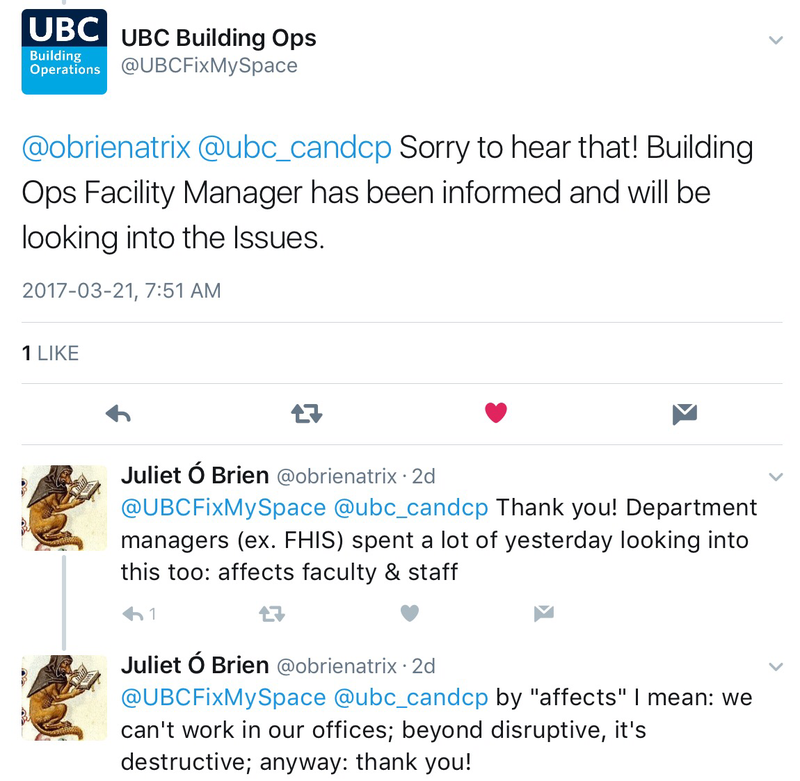 It’s not just individual work that has been disrupted, but interactive collective work and the social fabric of an academic department. Harm has been done: even if this were just to one person, once, that counts: but it has been to many, and many times, and without any concrete evidence to the contrary feels like a systemic practice. One or more human beings are responsible for causing harm; by action or by omission; through some combination of ignorance, negligence, carelessness, or indifference. A question of ethics. [Anonymous 2 to me] Wednesday 2017-03-22 4:20 p.m. Thank you […] I will raise your feedback and concerns with Project Services, the department managing the multiple projects in Buchanan Tower and around campus. […] In the meantime, I will continue working on improving the current situation to the best of my abilities. I just wanted to send you a quick note to let you know that we are still waiting for the information from the contractor regarding their planned activities for tomorrow and next Tuesday. I know they are working on this, and I will give you the information as soon as we receive it. [Anonymous 2 to various] 4:21 p.m.
[Anon1] is working on gathering details for a proper communication. In the meantime, the contractor has advised Thursday (tomorrow) will be highly disruptive (a notch down from Monday) with the bulk of it occurring in the morning. Please pass this on to your respective groups so they are given fair warning and can adjust accordingly. The above were passed on to faculty by department administrators within half an hour. [Me to Anonymous 2] 5:26 p.m. Thank you. From the timeline of the last updates on work […], it’s clear that there are serious problems in project planning and management. The fact that you were only notified late this afternoon of what is happening tomorrow morning puts you in an awful position, as the main contact person liaising with academic departments. You have my sympathies! A depressing turn in events. 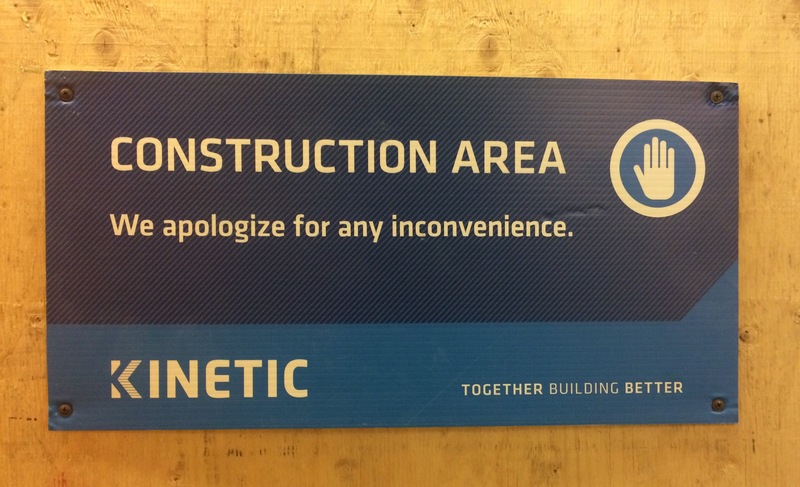 [Anonymous 1 to various] 1:28 p.m.
[…] Thank you for everyone’s continued patience and understanding during the upgrades and renovations in Buchanan Tower. As previously discussed, the contractor had requested two days of extended noise hours in order to complete the window installation on the 9th and 10th floor. After further discussion with […] and some of the Program Administrators, we have scheduled for next Tuesday (March 28) and Thursday (March 30) to complete the window installations. During this time, there will be continuous noise between 7:00 a.m. to 7:00 p.m. The contractor will be installing window frames which will generate some drilling and hammering noises. We understand that work of this nature is quite disruptive and we will be working with the contractor to mitigate impact as much as possible. We appreciate your continued support on this project and will provide updates to any changes as we move through the process. [Me to various] 4:54 p.m.
My patience is not continuing. It has ended. 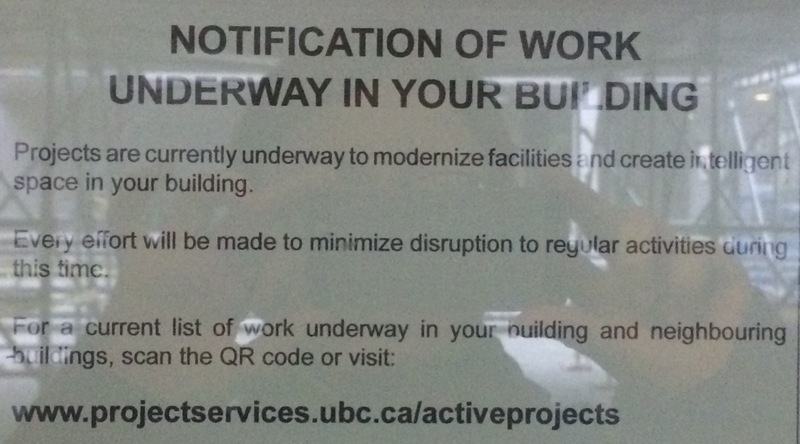 I’ve been patient for eight years while the health, safety, wellbeing, and rights of every other imaginable worker have been protected, including those of contractors who are not members of the university: but not faculty and staff. This has not been discussed with faculty who actually actively work in this building. This has not been discussed with faculty. 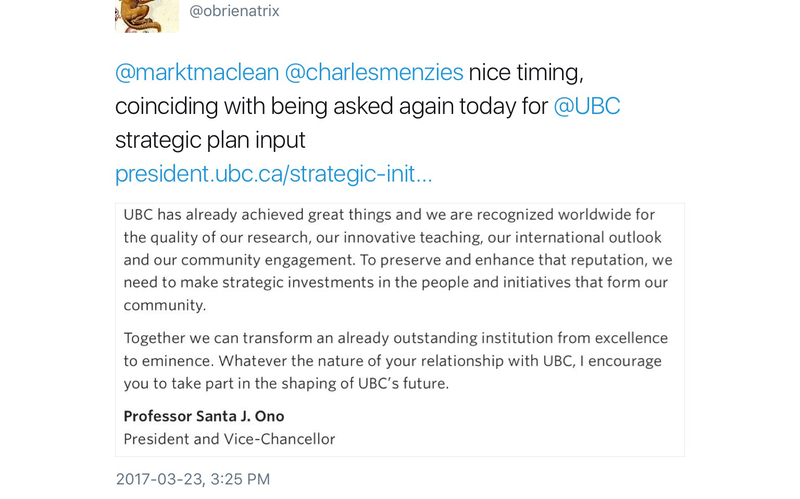 Indeed, there has been no consultation at all with faculty at any point: least of all at the key stage of preliminary project planning, which presumably occurred some time ago. Where, how, and when are faculty to work? From 7:00 p.m. to 7:00 a.m.? For example: What about academic advisers? I have to work in my office due to only consulting sensitive [student] data on my desktop computer there […]. And what do we do about office hours, which often involve consulting documents that stay in one’s office (ex. if a student wants to see an exam)? Extending my expert understanding and sensitivity—I work in and on literature, after all—to their limits, I am willing to give the benefit of the doubt and assume that this statement is well-intentioned and that “understanding” is at the very least like that assumed of faculty in point 1 above. I have no choice in the matter. As this was never a matter of consultation or consent, this project never had my support and therefore cannot continue to have it. Support is a matter of free active consenting ethical decision and agency. This situation is not acceptable. Further correspondence has featured many a C-word: communication, consultation, consent, cooperation, collegiality; trying to be constructive; in hope for future harmonious concert. I’m trying to avoid another C-word, cynicism. 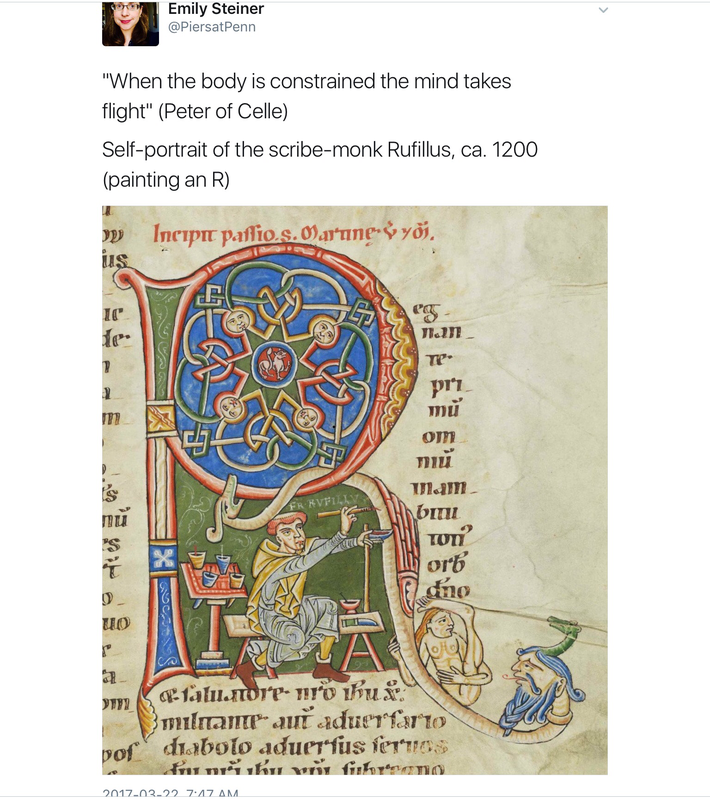 I’m no longer trying to avoid another one that is close to my medievalist heart: courtesy. Over the last two weeks and this present one, we have had several guests visiting the department. Job talks have been disrupted, which is a terrible breach of hospitality and an unconscionable ill-treatment of potential future colleagues already under pressure. One of our visiting speakers this week is an eminent illustrious scholar who is coming here specially, from far away. The main “creative work” in my department? The creation of extra work (and stress) in making last-minute room-booking changes. As for “intelligent space”? Well now, to be polite and diplomatic: we’re not talking Al-Andalus nor Alfonso the Wise. UBC could learn a thing or two from scholars’ working conditions at Alfonso’s court and at the Toledo School of Translators.